Researchers from Penn Medicine have discovered that ultraviolet (UV) robots can help to reduce the rate of common bacterial infections transmitted in hospital settings. The robots are programmed to flash UV lights into a hospital room that will lock onto the DNA of bacteria and organisms and destroy them. The most prevalent form of bacteria, Clostridium difficile (commonly known as C. diff) is highly resistant to disinfectants and antibiotics. C. diff impacts close to a half a million patients annually – they contract it while hospitalized and it kills nearly 20,000 of the patients who contract it. The risk is higher in cancer patients who have compromised immune systems. Using UV germicidal irradiation with the robot following a room cleaning has been shown to reduce the number of infections patients contracted and did so without impacting the room use turn-around time. It was also shown that those rooms that were not cleaned with the UV robot had an infection rate of more than 15 percent over the study period. The robot and its ultra violet light can kill the drug resistant bacteria on bedside tables, door handles, television remote controls and other surfaces in hospital rooms. 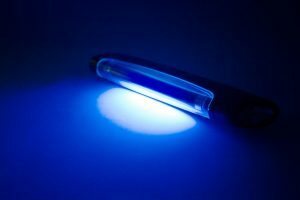 The research has shown that the UV robot could be deployed in expanded settings as a weapon against hospital contracted infections. It was shown that the UV light, turned on in the rooms for up to 45 minutes was able to destroy the bacterial spores in the rooms. Universe Kogaku designs and manufactures optical lenses for medical uses, industrial, high tech and electronic applications. Standard and custom lens assemblies are also available for scanners, CCTV, CCD/CMOS, medical imaging, surveillance systems, machine vision and night vision systems.